Bud’s two-stroke project bike started life as a Kawasaki KX250F four-stroke. 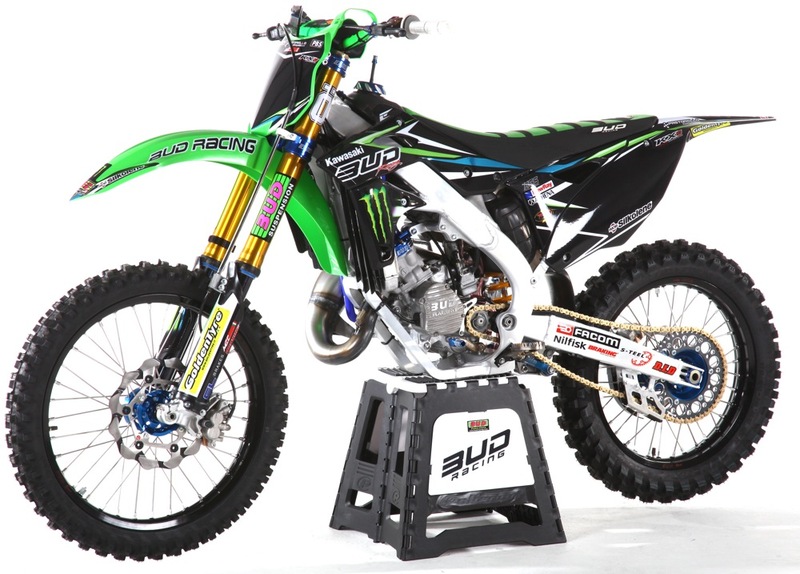 It is equipped with Ohlins suspension, 270mm Braking front rotor, Bud Racing wheels, rear holeshot device, triple clamps and graphics. It weighs 208 pounds. Bud Racing fields one of the largest motocross teams in Europe and are well known in America for bringing French riders to America and Americans to Europe—including Daniel Sanayei who was second in EMX250 this past season. For 2017 Bud Racing will support former Geico Honda rider Tristan Charboneau and the son of Former 125 West Champion Willy Surratt, Ryan Surratt, in the AMA 250 West, European EMX 250 and French Elite 250 series. Bud has a U.S. race shop in Elsinore, California, but their base of operations is in France. The KX250 frame was extensively modified to accept the YZ125 engine. 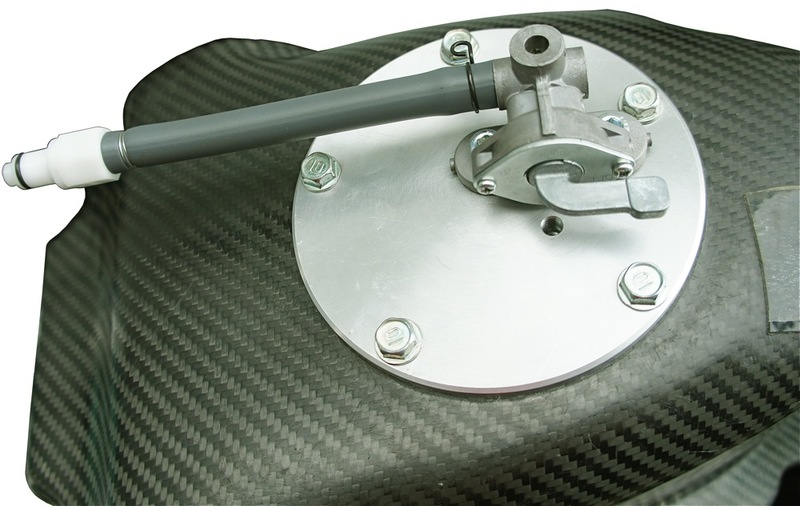 The complete frame cradle has been rebuilt along with a new head stay and motor mount brackets. As an official Kawasaki supported race team, Bud Racing also has a thriving development program that brings young French riders up from the minicycle to the 250 classes, both EMX and the French Nationals, but, what Bud noticed was that riders coming off 85cc bikes had a tough time making the jump to a 224-pound KX250F four-stroke. As they prepared French minicycle sensation Brian Moreau for the transition from little bike to big bike a few years ago, they had an epiphany — why not have Brian race a full-size KX250F chassis, but with a 125cc two-stroke engine. That way Brian would be riding a familiar two-stroke engine, similar, in the exact chassis that he would eventually in racing in the future. The bike could be raced in the EMX 125 Two-Stroke Championship. Bud Racing’s goal was to build a bike that would allow a KX85 rider to transition from a minicycle to a big bike without having to struggled with the weight of a four-stroke. Plus, since every KX85 rider is a proficient two-stroke rider, the only change in riding style would be for the more powerful 125cc two-stroke engine. 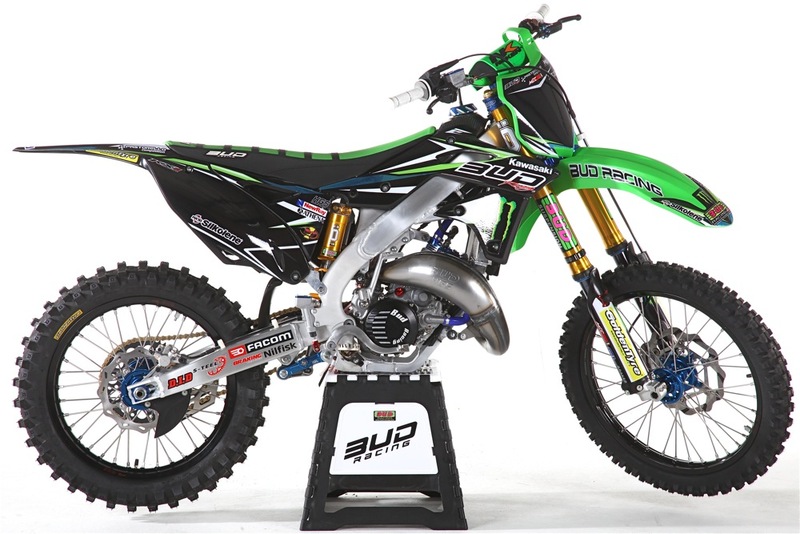 Thus, Bud Racing built this special 125cc two-stroke-powered KX250F. However, there were issues. As an official Kawasaki team, Bud could not find a sufficient supply of Kawasaki KX125 engines, since that model had been discontinued years ago. To make the project work they needed a solid 125cc two-stroke engine for which a large base of hop-up info and a good supply of part was available. The answer? A Yamaha YZ125 engine in a Kawasaki KX250F frame. 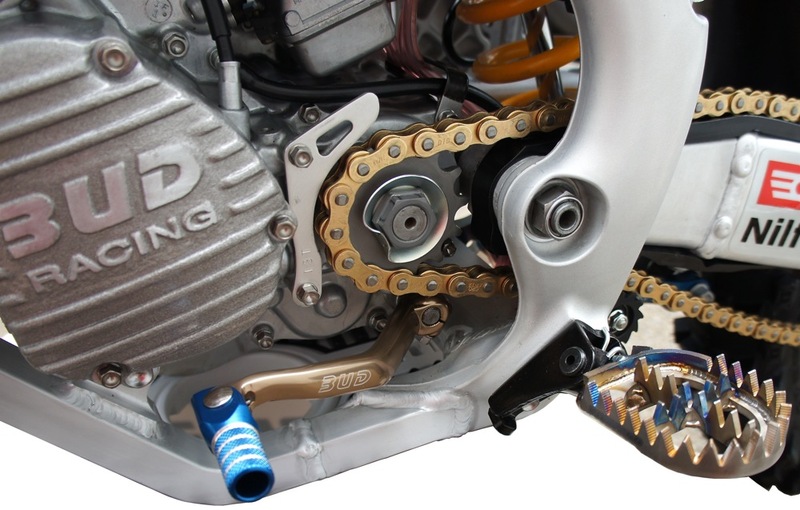 The YZ125 engine is still in production and technical information abounds. Of course the YZ125 engine didn’t fit. But Bud was ready for that and built a very special aluminum-framed KX250F to house the YZ125 engine. 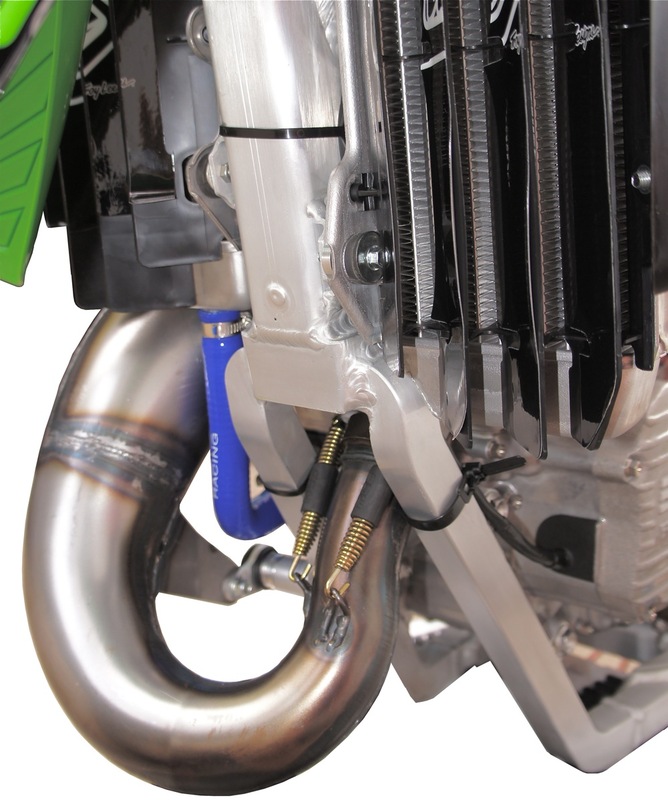 Here are some of the close-up details of Bud Racing’s KX125 Aluminum Edition.To learn more about Bud Racing go to www.budracing-usa.com or call (951) 245-2660. 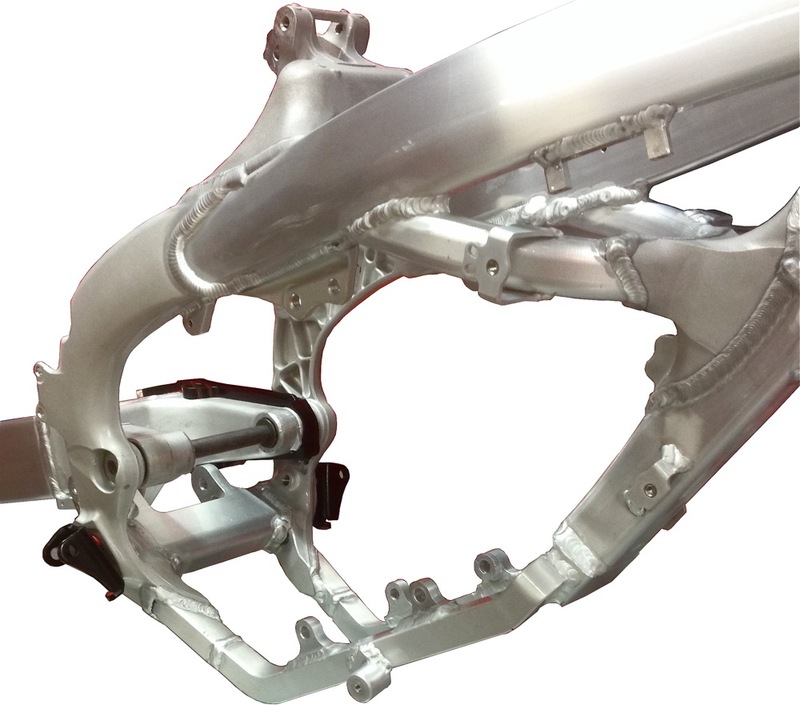 The work that went into reconstructing the KX250F frame cradle is evident in this photo. Everything from the down tube to the swingarm pivot is new. Although the YZ125 engine was a strange choice for a Kawasaki-backed race team, the logic of the move was based on parts availability. 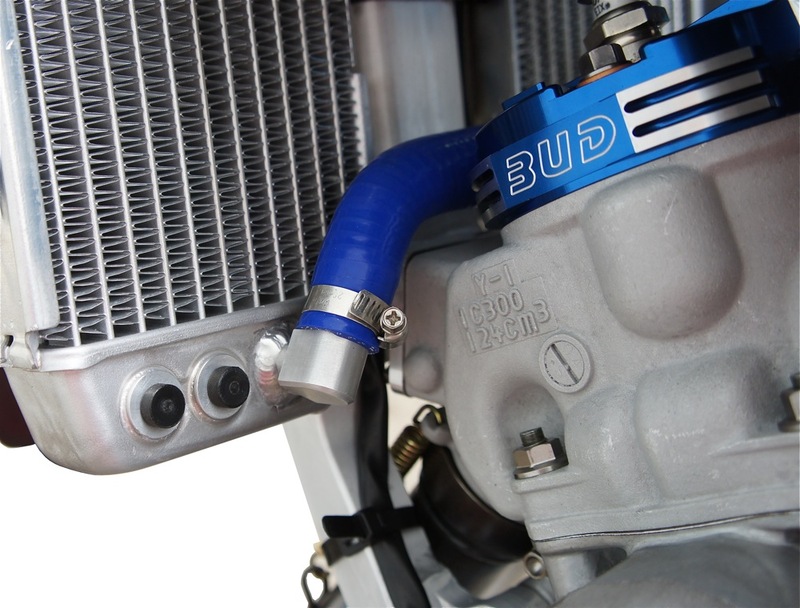 Bud ports the cylinder, adds their own cylinder head and runs a Bud designs HGS exhaust system. Bud’s KX250F framed YZ125 uses a special carbon fiber silencer, but the trickest part is the hanger bracket. Virtually every parts from the frame to the radiators to the head stay to the airboot to the gas tank to the airbox had to be specially designed to fit the engine/frame combination. Bud supplied the ignition and clutch covers and shift lever. The footpegs are titanium as are most of the bolts. In order to utilize the KX250F radiators, Bud Racing had to plug up the old fittings and weld a new spigot to align with the YZ125 hoses. 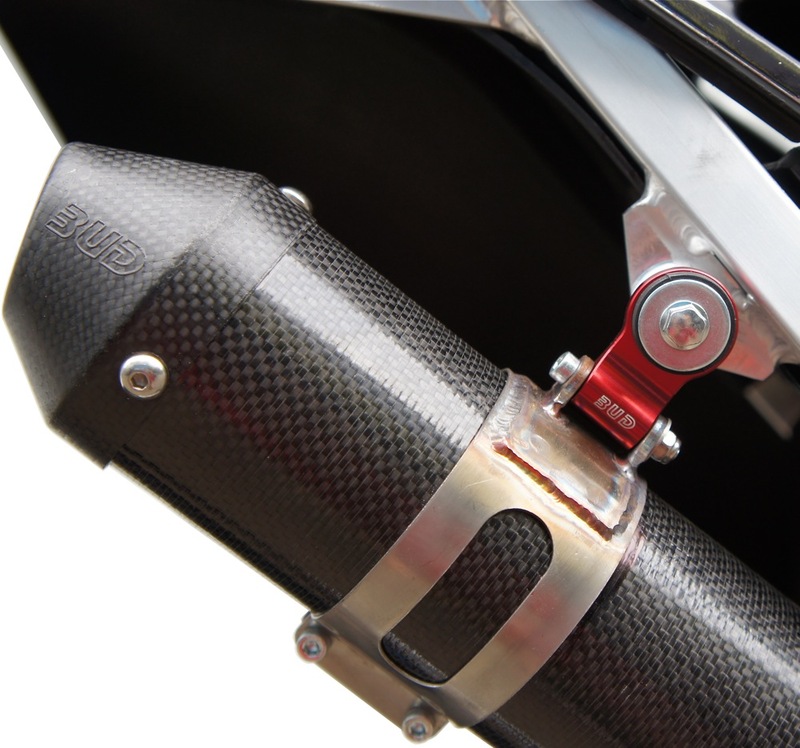 The carbon fiber gas tank was a major part of the Bud Racing project bike, but since the YZ125 engine does not have fuel injection or a fuel pump, all of the four-stroke gas lines had to be removed and new plate designed to accept a petcock. 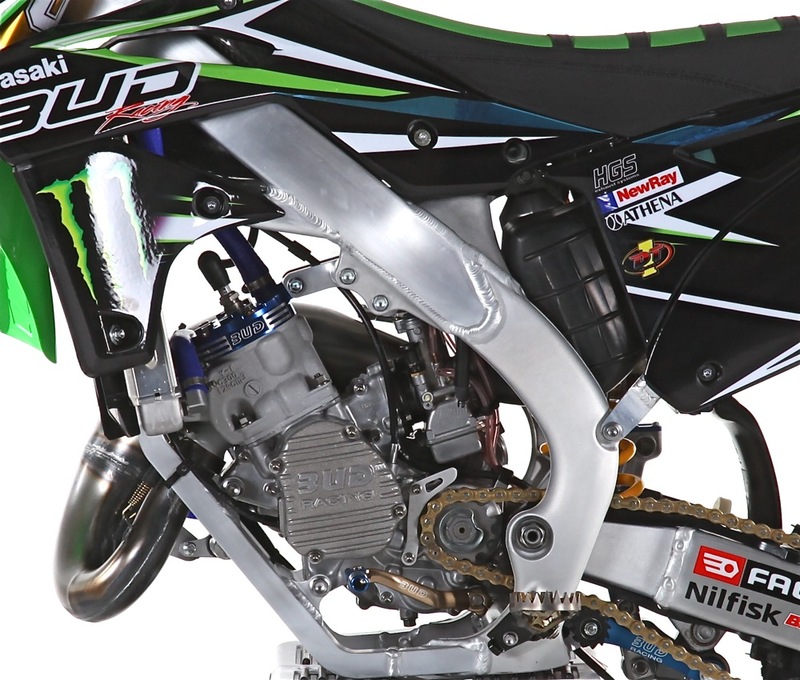 The carbon fiber and titanium parts, along with the lightweight two-stroke engine, knock 16 pounds off the the KX250F.